I have always been interested in engines and things mechanical as far back as I can remember. My first real job was in the machine shop of a local factory that made small-specialized electrical components. All of the specialized assembly machinery was in house designed and hand built. I learned early; you can not always buy off the rack, sometimes you have to invent it and make it yourself. I started work as a professional motorcycle mechanic in 1975 at Honda of San Diego after graduating from motorcycle technical college. Within two years, I was working and tuning on a Yamaha TZ-250, we finished tenth novice in the U.S. 1977. More road racing including exposure to the early L.A. Superbike scene. I later moved back east and started working for “E.C. Birt”, the father of two-stroke porting and motorcycle hot rodding in America, where I became the head cylinder porter. I did all of the porting including the secret back door Team Honda and Team Kawasaki factory barrels. Returning to southern California, MX and road and drag racing. That evolved into working on and building Sprint Cars which lead me into CART/Indy Cars. By the end of the 1980’s, I was building IMSA/GTP and other engines at “Ed Pink Racing Engines”. In the early 1990’s I worked in NASCAR Winston Cup in the engine shop for the late “Alan Kulwicki” and later, “Geoff Bodine”. I was one of the original people in NASCAR to learn and operate Data Acquisition systems in Cup racing. I also picked up factory training and certified for Mercedes Benz, Ford, Chevrolet and Honda. I used this and my racing background to be accepted to “Kienle Automobiltechnik” outside of Stuttgart, Germany to advance my knowledge of Mercedes Benz restoration. My wife Jackie and I moved west again, to Santa Cruz in 1996. I did a few restorations but found that I missed racing so in 1997 we opened Replika Maschinen, Inc. In our brief history, we have won AHRMA Northwest regional championships, the “Steamboat Springs Iron Man” and motorcycle and auto races on dirt and asphalt. Our cylinder heads helped a good young local driver win the “IMCA World Open” in Las Vegas in 1998. A 1998 YZ-250 we ported helped a + 30 Expert through a ten race win streak in the Northern Calif. “Open class”. Billy Juervich won the national Arena-Cross rookie of the year with our porting and coating work. We build 250cc engines that regularly beat open bikes, like the 2000 “Hangtown” open/expert class winner. We also design and build vintage engines for people like world champion “Bad” Brad Lackey. 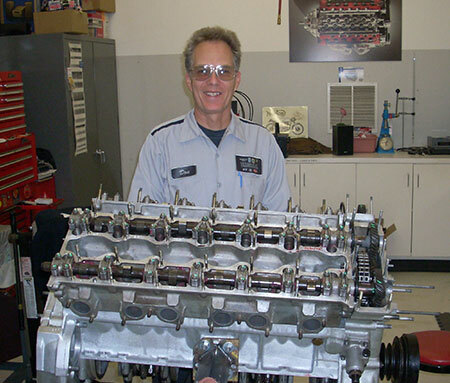 We helped Dan Rodoni win the Monster Truck rookie of the year in 2005 with our cylinder heads and thermal coating. We have Ford modular engine cylinder heads on some very fast Mustangs and Ford trucks. The Mazdaspeed Rally car produces excellent power with RMI heads and coatings. We are building increasingly more Regional and National race winners. We have ported four-stroke cylinder heads that have produced over three horsepower per cubic inch to the ground. We have doubled the torque output of two-stroke engines, expanded their power bands and made them tractable. We have made “Harleys” and diesel trucks faster and more fuel-efficient. We have also attracted the attention of some very fine engine builders, companies and corporations for whom we do thermal coating and cylinder head R&D and porting work. We have made many drivers and riders, fast and happy. We can help you go faster as well.